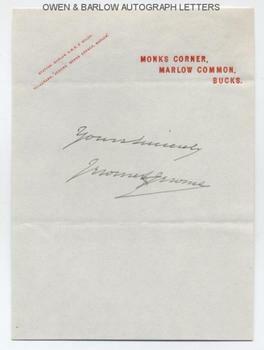 JEROME K JEROME autograph Signature. Jerome Klapka Jerome. British (English) comic author, best known for the classic, 'Three Men in a Boat'. Autograph presentation signature "Yours sincerely Jerome K Jerome" on his headed note paper. Monks Corner, Marlow Common, Bucks. No date but circa 1918. 8vo. Approx 6.75 x 5 inches. Mounting traces to top edge of verso, else fine. 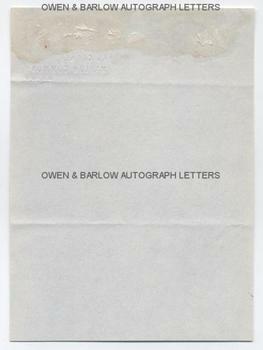 A fine, large signature, purposely signed for an autograph collector and not one that has been extracted from a letter or document.